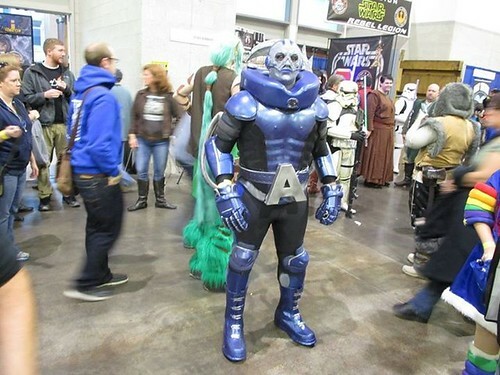 Local people might have heard about this already, but Rhode Island Comic Con was a mess. And calling it a mess is me being kind. It seems that the promoters vastly underestimated both how popular comic/pop culture conventions have become, and the amount of turnover over they would see. Both things are surprising given the news out of San Diego and New York. I and my merry band were some of the lucky ones who actually got into the Con. It paid to make it an early morning and get in line before the doors open. That said, it was pretty clear by the first hour that things were over sold despite the organizers' claims to the contrary. By early afternoon they were no longer letting people in due to the venue being close to fire code capacity, however, I heard they were still selling tickets (not cool at all). Many many people missed out on the con, stuck outside in lousy weather, and many were separated from their parties due to the sudden enactment of a "no re-entry policy". If you want to know more check out the twitter hashtag: #RIComicconfail2014. In spite of all this I was able to get into the con and have a little fun before completely redlining due to the crowds. So here's a rundown of 5 things I saw before realizing it was time to leave and have some nachos, hence avoiding the impending nervous breakdown. I was lucky enough to be making my way through the celebrity area just as the original series Star Trek cast was arriving. Clearly they hadn't had a chance to see each other before stepping out onto the con floor. 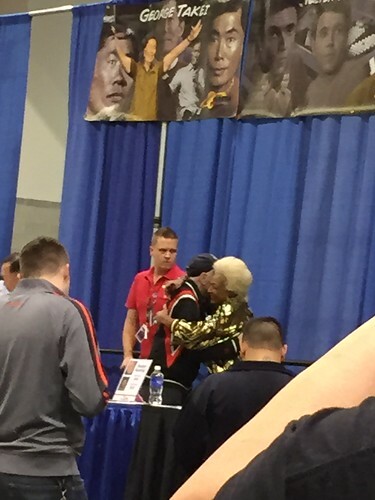 I wasn't fast enough to get a pic of the group hug between George Takei, Nichelle Nichols, and Walter Koenig. In truth I was overwhelmed by the absolute fondness these three had for each other. It was so magical watching these old friends greet each other, old friends who kinda felt like my friends even though we've never met, weird, I know. 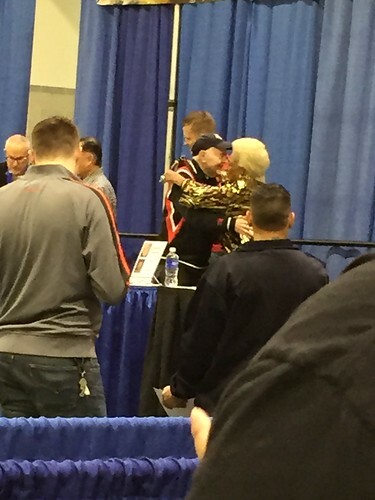 I was able to recover in time to grab two quick pics of Nichols and Koenig sharing a sweet hug. Yeah, there might have been a little something in my eye as I retold The Goog what I'd witnessed. Last summer Smalerie and I introduced Little J (our littlest and much younger sister) to Jem and the Holograms. Needless to say it was a hit. So I got her a t-shirt for her birthday last year, but when she wore it to school none her of friends had ever heard of Jem. Her teachers, on the other hand, thought it was the best shirt ever. Well, apparently I haven't had enough of pushing my nostalgia on her and when I happened upon Samatha Newark, the voice of Jem/Jerrica at the con, I could not resist picking up a signed hat as to remind Little J to stay truly outrageous. Show time, Synergy. Continuing my trend of people who seemed glad to see each other and my own nostalgia, I was able to make it into the Raiders of the Lost Ark reunion panel. 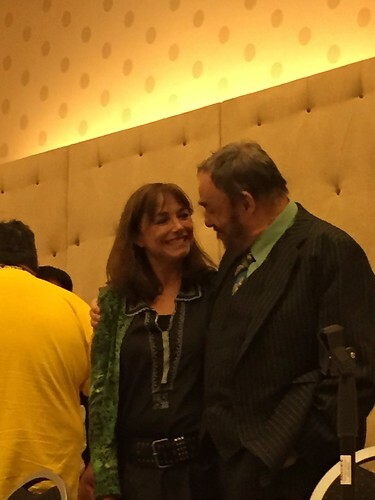 The reunion was between 2 of the stars, Karen Allen (Marion Ravenwood) and John Rhys Davies (Sallah). Things started a little rough for Mr. Davies, as he kept getting interrupted by the Con PA system announcing lost parties (there were a LOT of lost parties at this con, likely due to the crowds). But once that quieted down it was a fairly typical panel of 30 min of moderated questions, and 30 min of audience Q&A. We learned some fun tidbits about the filming of the movie. Did you know that 6,000 of the snakes in the snake pit were real? Also, that part when Sallah breaks out into Gilbert and Sullivan after kissing Marion good-bye? Totally improvised. We also learned some hard truths about being an actor and the importance of having a back-up plan. Allen is a fiber arts shop owner in Great Barrington, MA these days, while Davies stressed the importance of treating every job like it's your last, and everyone who works on that job like they are the ticket to your next one. 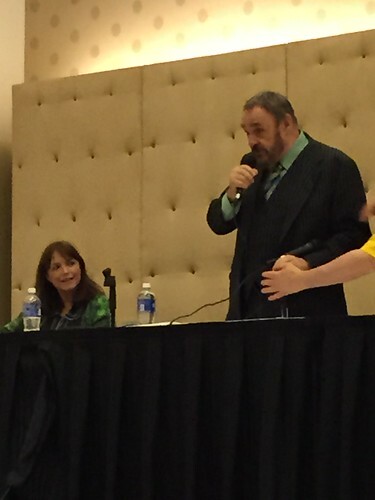 Both actors were a total delight and seemed like they would have loved to keep on talking, especially John Rhys Davies! When the moderator tried to close down the panel so the next one could start, Davies motioned to the next question-asker to come forward and mimed for them to just start asking their question. Hilarious. 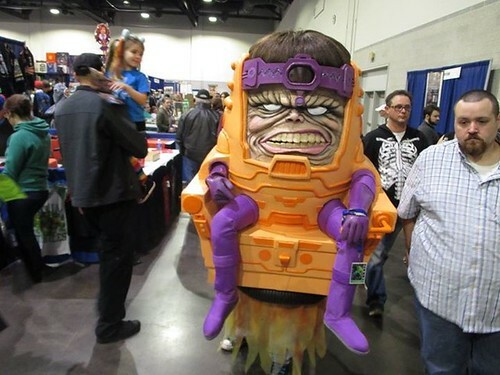 I actually think the Cosplay at RI Comic Con was a step above Boston. While there were lots of top notch costumes, these two made us just say "wow". Thanks to Gary for the photos! Friend of the Ladies Tonya Ratz draws custom themed dragons. 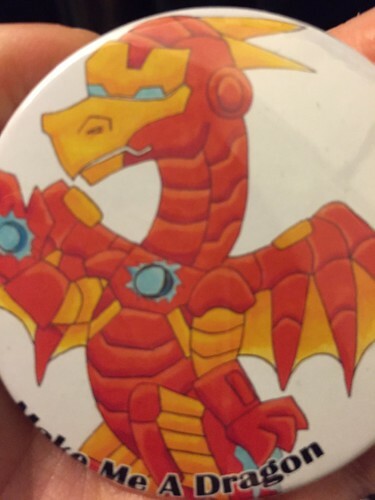 Want to see what Iron Man would look like as a dragon? She's got you covered. Want to see what you would look like as a dragon? She can do that too. While at the con she even whipped up an Invader Zim dragon to give to voice actor Richard Horvitz who was in attendance at the con. Special thanks to Tonya for letting me put some Ladies swag at her table. So, would I go back to RI Comic Con? Probably not. It was a show that I have heard was really fun in the past, but it's clear the organizers are not ready or prepared for the influx of attendees. Can they fix that in one year? Not sure. But I did at least have some fun, and some nachos.